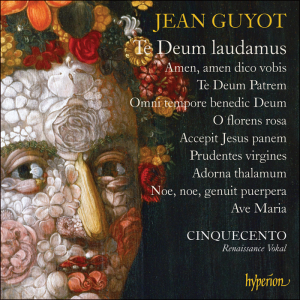 Jean Guyot was another of the composers of the post-Josquin generation active in the Low Countries in the mid-sixteenth century. (He was also a priest, author and teacher, although the details of much of his life remain vague.) Cinquecento has previously explored his secular music (on ‘Amorosi pensieri’), but it was Guyot’s sacred music which was largely responsible for the high reputation he seemingly enjoyed in his lifetime. Cinquecento proves equally authoritative in both.